Last Saturday for Shabbat lunch, I invited over a friend who’s on a a gluten-free diet, so I started doing some re-search (i.e recipe search) on the web. This is what came up as a result of putting together a couple of recipes and what I thought would be a decent gluten-free dessert, turned out to be good stuff! Mix all the ingredients in a food processor for about 1 minute or until it forms up like a ball. Put mix in a bowl and place it in the fridge for about 10 minutes. Then form 20 small round truffles with your hands. 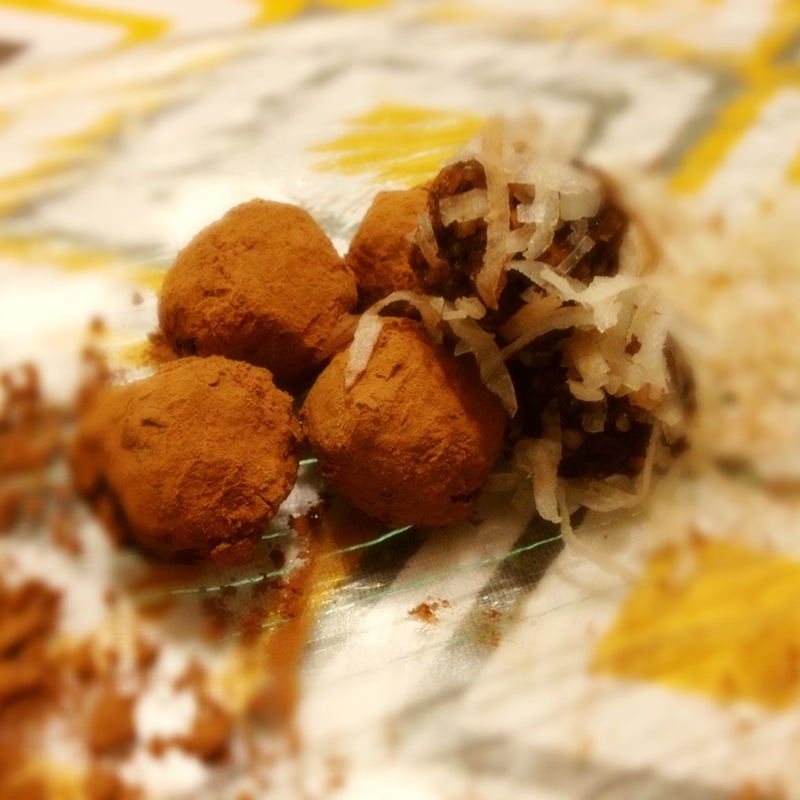 Roll them in cocoa powder and shredded coconut. Place in a tupper layered with parchment paper and put in the fridge for at least 20 minutes before serving (I made them overnight and it worked great).Who doesn’t love a guilt-free desert? El sábado pasado para el almuerzo de Shabbat, invite a una amiga que esta en una dieta sin gluten, así que empecé a buscar recetas en internet . Esto es lo que salió como resultado de mezclar un par de recetas que pensé iban a hacer un postre decente y termino siendo algo bien rico! Mezcla todos los ingredientes en un procesador de alimentos por un minuto, hasta que se forme una bola. Pon la mezcla en un tupper en la nevera por unos 10 minutos. Luego haz unas 20 trufas con las manos. Pásalas por polvo de cacao o el coco rallado. Ponlas en un tupper con papel pergamino en capas y mételas a la nevera por unos 20 minutos antes de servir (yo las hice la noche anterior y funciono belleza). Quien no ama un postre sin culpa?